Easy UML Use Case diagramming software with rich examples and templates. Edraw is ideal for software designers and software developers who need to draw UML Use Case Diagrams. In the early stages of a development project, use case diagrams (use case: In a use case diagram, a representation of a set of events that occurs when an actor uses a system to complete a process. Normally, a use case is a relatively large process, not an individual step or transaction.) are used to describe real-world activities and motivations. You can refine the diagrams in later stages to reflect user interface and design details. Easy UML use case diagram software with various examples and template. 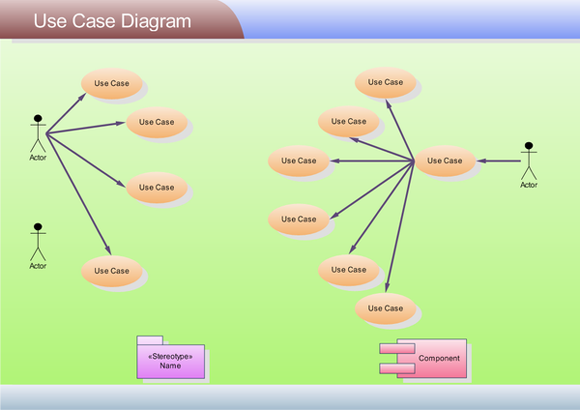 In Edraw Professional, the UML Use Case Diagrams templates and shapes are in the Software folder. Software developers: Illustrate and interpret software application relationships, actions and connections. Edraw is an ideal software to draw UML use case diagrams.